What Was the Most Important M.U.S.C.L.E. Event of 2011? For the last five years there has been a retrospective look at the universe of M.U.S.C.L.E. collecting. What did we see this year and what might we see next year? 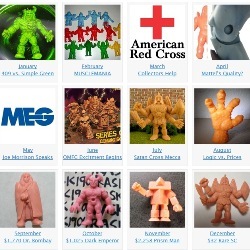 Details about each of the “Super Rare” M.U.S.C.L.E. figures can be found in History 300. The goal of Philosophy Philosophy 200 is to examine the mysteries that surround these figures in addition to presenting theories about the source and cause of “Super Rare” M.U.S.C.L.E. figures. This section focuses on the Non-Poster Beta Figures. Normally during early April the internet is bombarded with April Fools’ pranks. Rarely do they prove to actually be fun. As the University of M.U.S.C.L.E. started to tease collectors that a Purple #153 auction was getting closer, it appeared that the auction could be something fun that actually happened near April 1st. Instead the first weekend in April had mixed results.